Celebrated on the first Friday of every June (that’s tomorrow! ), National Donut Day means specials, deals and donations at doughnut shops across the country. 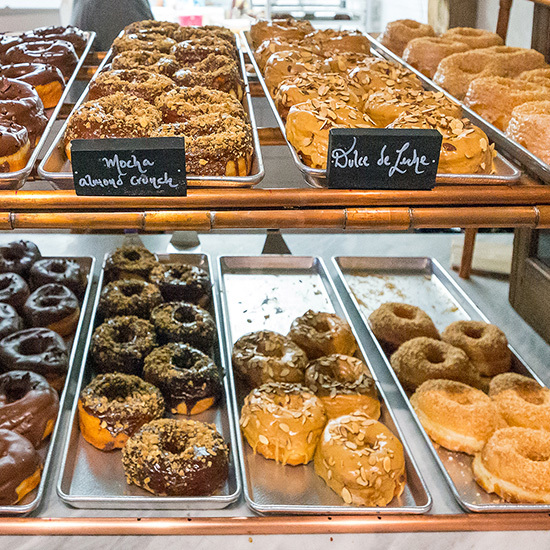 Here, six great Donut Day offerings to seek out tomorrow. In 1938, a military doctor named Morgan Pett picked up eight dozen doughnuts on his way to a military base, where he gave a doughnut to every wounded soldier he helped. Pett’s random act of fluffy, fried kindness grew into a nationwide fundraiser for The Salvation Army, and National Donut Day was born. Now celebrated on the first Friday of every June (that’s tomorrow! ), National Donut Day means specials, deals and donations at doughnut shops across the country. Here, six great Donut Day offerings to seek out tomorrow. In honor of its location (a functioning carwash), the shop created the Carwash Donut, which they will unveil tomorrow. The glazed, multicolored, striped doughnuts were designed to mimic the carwash experience. Blue Star Donuts will debut their limited-time-only rosé wine-glazed, rose-water-and-candied-orange brioche doughnut in celebration of both National Donut Day and the Portland Rose Festival. A portion of the proceeds from the special doughnut will be donated to The Dougy Center, which gives support to grieving families. The shop’s classic Vanilla Bean Glazed doughnuts will be sold for just $1—with 100 percent of the profits going to the Semper Fi Fund for injured U.S. Armed Forces members. DC locals who can’t make it into the shop can take advantage of a special delivery deal. A limited number of four-doughnut boxes will available for delivery for $5. Tomorrow, every purchase at NYC’s Doughnut Plant will come with a free Carnival Sprinkles mini cake doughnut. Buy a box of six or more doughnuts tomorrow at Brooklyn’s famed Dough doughnuttery, and you’ll be entered into a raffle to win a year’s supply of doughnuts. Federal asked fans to vote on a currently discontinued doughnut to bring back for National Donut Day. The winner: Cookies & Cream, which beat out flavors like Marshmallow Marshmallow and French Toast.